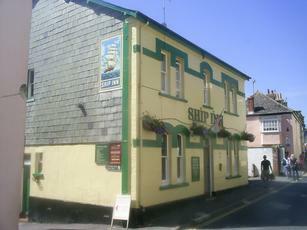 The ship is just a few steps away from the bustling main Road,It is a no frills Palmer pub with a warm welcome. A pool table in the basement which leads to a small tabled patio.It is usually quiet which can be a relief as Lyme can be sardine packed on a sunny Summer's day. A reasonably enjoyable boozer which serves as an antidote to the enjoyable albeit very middle class charms of the nearby Town Mill. We watched the World Cup quarter final between Holland and Costa Rica here and it proved to be an enjoyable experience. Beers are from Palmers who do reek a little of the local (presumably Tory) establishment so they are just fine but not scintillating. A basic, no frills boozer a short stroll away from the town centre. First impressions were not good, with a noisy young toddler running around and nearly colliding with us as we entered. We should have taken that as a sign to leave, but as I find it very difficult to leave a pub without having a pint, we persevered. The pub is a sideways U-shape in layout, with the front bar having rough boards on the floor, a curved, wooden bar counter, wood panelling on the lower part of the walls and some old painted wallpaper up above. Wooden bench chairs with red upholstery were arranged around the perimeter of the room, and there were numerous pictures on the wall, many of old ships from the White Star Line and old photographs of the town. A piano was in one corner along with a plasma, although this was turned off and there was also a fruit machine. It could really have done with a little background music, either from the plasma or something else. Besides the toddler�s parents, there was only one other punter in there which made it all too easy to hear the landlord swearing down the phone. Later on a large horde of cackling females arrived so it went from one extreme to the other. The only beers on tap were both from Palmer�s, with their Best Bitter and Copper Ale. It looks as though 200 may usually be on, but the pump clip was turned round on this occasion. The solitary cider was Thatcher�s Gold. 'Jester' said they were actually Wolves fans. Found this little gem down the back streets of Lyme. Seriously cosy, a proper pub. Stocked the usuals, Thatchers cider and Palmers beers - Palmers Best / IPA was kept well, consistently good, smooth as silk. Excellent finish to a great night. Brilliant atmosphere - despite being half full of Albion fans - very friendly, certainly return. Back again in May.